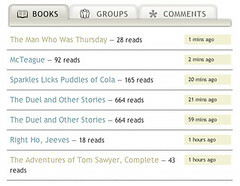 « BookGlutton Profiles – See What I "Recently Read"
This new homepage inset lets you keep track of the most-recent books read, groups formed and comments made. It’s more compact so you can peruse all the homepage info quickly and easily. Also – it has those fancy new tabs.